Read “But I’m Not Tired!” Think about the ideas the author presents in this article. 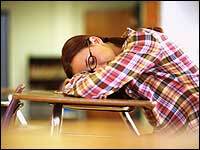 What changes should schools make to adjust to students’ sleep patterns? Write a letter to the principal recommending changes that could be made at your school to adjust to students’ sleep patterns. Be sure to include specific information from the article to support your recommendations. Do not merely summarize the article. Remember that your response will be evaluated in two ways–on your understanding of the article and on the quality of your writing. Posted on October 20, 2009 by Ms. B.. This entry was posted in Journal, NonFiction and tagged commenting, Homework, Journal topics, Journal writing. Bookmark the permalink.